Governor Raymond Philip Shafer was born March 5, 1917, in New Castle, Pennsylvania, and raised in Meadville, Pennsylvania. He graduated from Allegheny College in 1938 and Yale Law School in 1941. He served in the U.S. Navy from 1942-1945, where he was awarded the Purple Star, among other honors. 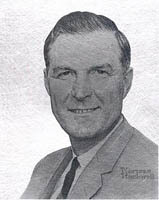 Shafer held the public offices of District Attorney in Crawford County, and Lieutenant Governor before being elected Governor of Pennsylvania in 1966, serving his term from 1967-1971. Today, Shafer is associated with law firms in Washington D.C. and Meadville, PA, while continuing his life of public service. This website presents the outlines of a biography of Raymond Shafer, illustrated with materials from the Raymond P. Shafer Collection, Pelletier Library, Allegheny College. Click on thumbnail images for full size pictures. Follow the arrows to move through the exhibit chronologically. For quick navigation, use the BIOGRAPHY site map. The Resources page includes bibliography, description of archival resources, and links to useful online sites. Gathered here are all of the links listed as "Additional Resources" on the individual biographical pages.